As promised, encore presentations of some of our most popular posts. This post “How to be a Scholar. 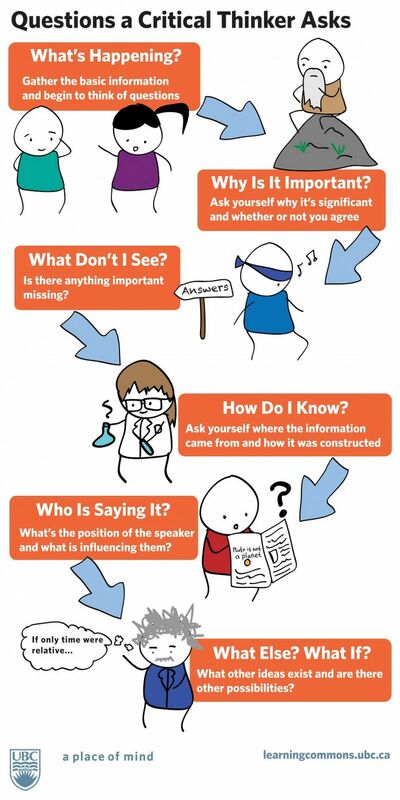 6 Steps to Encourage Critical Thinking.” is a reader’s favorite over on Pinterest, where it has been “repinned” many times. I like the visual appeal of the infographic and will once again use it this Fall in my Freshman Composition classes. The #1 most important skill for any college student in any discipline or major, is critical thinking. This is a simple infographic that could be used as a poster in the classroom. It would serve as a reminder to students to ask themselves the type of questions that will lead to them developing their critical thinking skills and become bettr learners.